A native of Bari, Italy, Ms. Russo received a Bachelor’s degree in singing and a Master’s degree with highest honors in singing specializing in chamber music from the “S. Cecilia” Conservatory of Music in Rome. She attended master classes with Edda Moser, Renata Scotto, Renato Bruson and Alberto Zedda. A winner of many important contests, Ms. Russo has performed in Italy and abroad and has collaborated with many acclaimed conductors and composers. Among the most important roles she has played are Norina in Don Pasquale by Donizetti, Fiordiligi in Così fan tutte by Mozart, Tonina in Prima la musica poi le parole by Salieri, Gilda in Rigoletto by Verdi, and Nannetta in Falstaff (starring Renato Bruson) by Verdi. In 2011 she won “Best Female Vocal” at the Hollywood Music in Media Awards. She has recorded Brise de Mér, Leoncavallo’s arias for voice and orchestra on the Suoneria Mediterranea label, with the direction of Luigi De Filippi. In 2013 she opened for Andrea Bocelli at Paramount Studios, performing with David Foster and Eugene Kohn, and performed at the Ann and Moss Theatre in Santa Monica with Maestro Andrea Morricone and the Amor Symphonic Orchestra. In 2014, together with pianist Giulia Spinedi, she won first prize in the Chamber Music section of the XVII International Competition V. Scaramuzza. As winner of the Beverly Hills recital series in 2014/2015, she performed at prestigious venues in the City of Beverly Hills. Currently she is writing for the Italo-Americano newspaper as Opera reviewer. Recent performances include a concert in Toronto for the Italian National Day Celebration at Casa Loma Castle in May 2015. 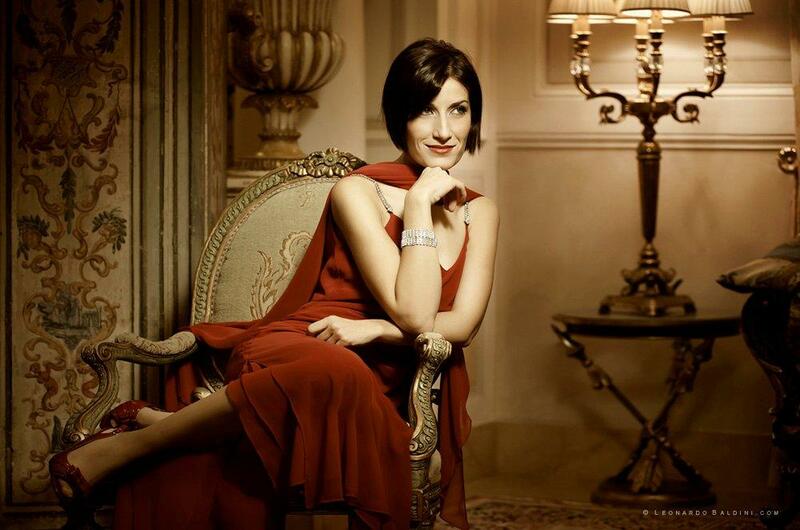 For her appearance at the Couture Fashion Week New York soprano Elisabetta Russo will wear a Mark Belford gown.